The intensity of our stares would have caused an awkward person to melt down. The way we were looking at the seemingly endless shrubbery would be comparable to a mother’s stare of “I’m not mad, I’m just disappointed” with the miniscule number of animals. The second day of safari was withering under comparison to the day before, except for the sunrise, which had been nice and gorgeous but today was something else entirely. The cloud cover was thicker but the sun, as always, found a way through. 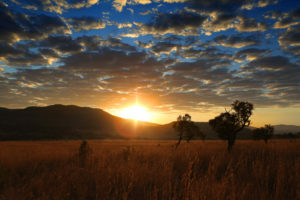 That resulted in brilliant moments of golden orange rays fighting for our warmth, which even brought pause to our guides. 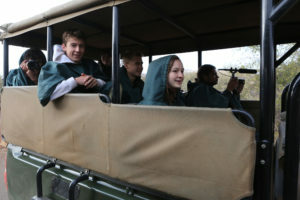 On the first day we had seen most everything in the big five and beyond, but the second day was less eventful. It may have been that we were walking but even still the previous groups had been entertained. We began with the enticing find of two large male lion tracks just a few feet away from where we started. The luring continued with large male hyena tracks on the same path. In spite of the obvious fear of two major predators ahead we were excited to see something close and on foot. As we continued onward and upward we learned of the warthog dens that are almost naturally occurring land mines: if you walked in front of them they may run out and break your leg out of fear for their families. We trekked further up and into the valley, and we still did not see any of the imagined predators we were initially tracking. Throughout our tough group of ten, including our trusty armed guides, continued to scour the bush. Our nearly biblical amount of effort finally showed itself when we were almost back to the truck. We were moving quietly along an old elephant path when the guide in front pointed out two white rhinos about fifty feet away. The pair was a mother and child, unlike the two brothers from the day before. The pair was happily munching on the shrubs and had not noticed us just yet. We sat in silence for a few minutes watching and snapping a few pictures until the guides had us move along. When we began moving again the mother picked up on our brave few and then faced that direction for the sake of protecting her child. She remained facing that direction with the ever-terrifying mother look even as we moved around toward their flank. As we began to lose sight of them, they decided that they had had enough and ran away from us in an amazingly large and graceful springy gallop. We went back to the truck and headed to our beloved lodge for R&R. As potentially noted in previous posts, it is winter in South Africa and winter is cold. That simple and undeniable fact made the hours between our adventures filled with obligatory mundane cups of tea, coffee, or my personal favorite, hot chocolate. There were pools around, but they were designed for cooling off, something that would end in a lovely case of hypothermia if attempted now. Before too many cups disappeared it was time for our afternoon and sunset trip. 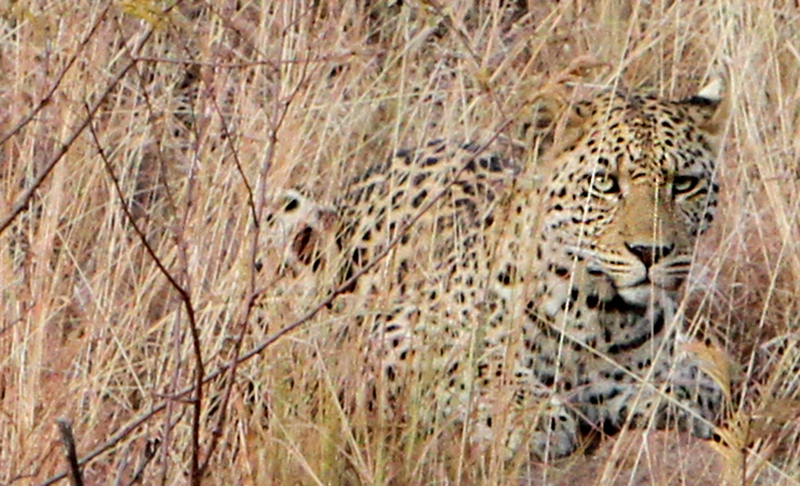 My group set out with the goal of spotting our final of the big five, the leopard (which one group had already seen). The intensity was equal if not greater than the morning’s strength. We were now with our knowledgeable and sure-handed driver Johann, with whom we shared our goal and agreed. We went around the property pausing whenever we had a potential sighting. This resulted in lots of stops for the usual gazelles and antelope that had our group continuing our disappointed stare into the bush. We saw a couple of zebras and a herd of cape buffalo, but still we felt as though we were missing out. We did see a pair of male rhinos, whom I believe are the same from the first day, and they came equally close, but still we scoured and peered to spot the already spotted. As many jokes can be made about spotting spotted animals, our groups morale did not improve until we stopped for sunset and drinks. As we watched the sun go down in a similar manner to how it came up, the poncho dance was invented. It is an embarrassing combination of arm and leg waving while wearing the absolutely necessary safari ponchos because it is cold in the winter. 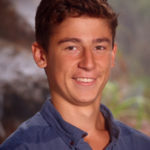 With our spirits raised from a few rousting rounds of the dance we decided that we would absolutely see our final of the five tomorrow morning at the last possible opportunity. With our hearts set, we moved off to bed to dream of leopards and planes. 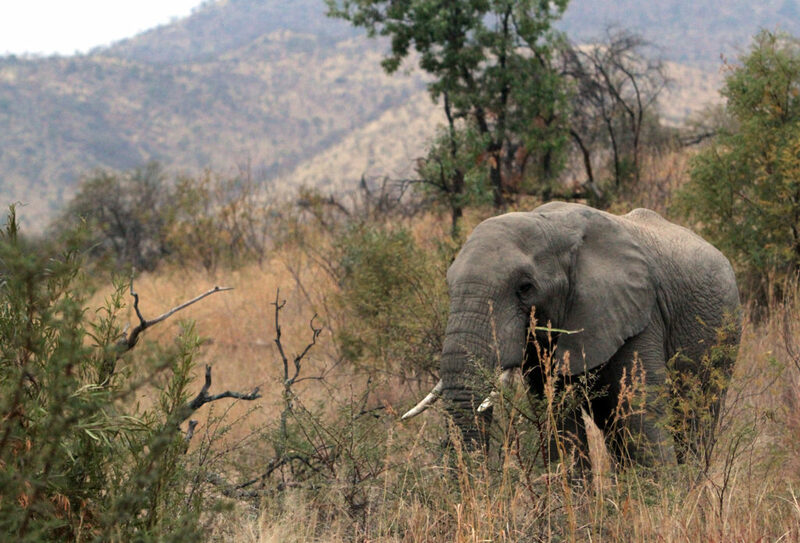 The safari in Pilanesberg was one of the most intriguing experiences of this trip. Not only was I surprised with the constant variety of animals, but there was so much that I got to learn from my guides throughout it. We started our first day with a pair of white rhinos standing on the side of the road. I was quite shocked that I was sitting in a windowless car, seven feet away from a two thousand pound animal just calmly standing there. After that I encountered an elephant rubbing its trunk on the hood of the truck, a pair of male lions eating a wildebeest, a lone ostrich wandering through a desolate savannah, and a squadron of hippos and crocodiles hanging out by a lake. 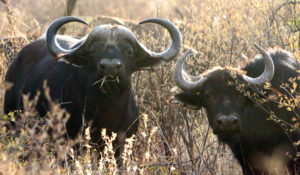 The “Big Five” classifies five animals in the African Savannah. The lion, the rhino, the buffalo, the elephant, and the leopard. Our guide told us that the two rarest animals in the park were the black rhino—some subspecies of which are extinct—and the leopard. I didn’t expect to see either. We drove through leopard territory quite a few times and were told to look outside for a female leopard. 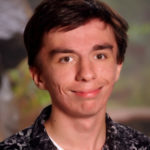 After a while, Nathan screamed, “There!” and pointed towards a hill covered in shrubs and rocks. 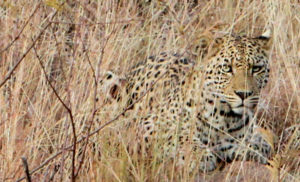 It took everyone about twenty seconds before spotting a female leopard lying on the side of the hill. The guide was in awe and started to take pictures himself. Before declaring that we had seen, “The Big Five”, he mentioned that this was one of the rarest occurrences in the park of Pilanesberg. This got me really excited to be having such a rare and lucky experience in the safari. As soon as I returned to the lodge, I bragged to every person who didn’t see a leopard. 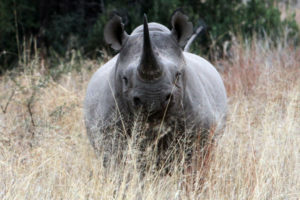 The black rhino was the animal I had been studying in biology all year. 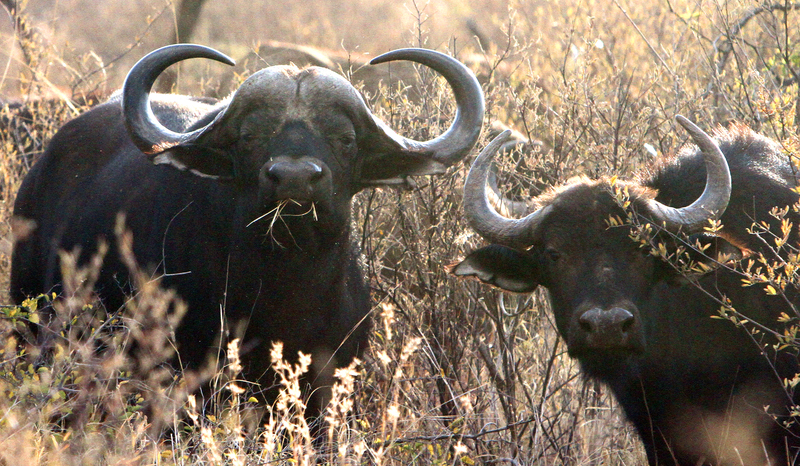 They were officially confirmed extinct earlier in 2015, but Pilanesberg still has a few left in their park. It saddens me that I didn’t get to see one on this trip before there were none left. However, I’m grateful that the park is still protecting them. I am also glad that there are still quite a few white rhinos left. Thanks to Lisa and my safari guides, I have never cared so much about trying to protect a species of animals as I do for the black rhinos. I think it is great for anyone to have an experience like this. Not only is it fun and engaging, but it can really change the way you think about nature and the rest of the world. I still have one more safari before I return home, and I hope to see as much as I can. UPDATE: I’m writing this last paragraph roughly twelve hours after the last ones. This morning we were given the option to wake up 6:00 AM to go on one last safari. I decided to go on it knowing that I would probably never get another chance to go on one. A fair amount of people in the class decided not to go. They chose wrong. We started the ride off by seeing some giraffes, some white rhinos, and an elephant, but about 30 minutes into the drive, Clio spotted a galloping rhino on the side of the hill. We all turned our heads expecting a white rhino. Donnie, our guide, calmly said, “That’s a black rhino”. We all were in shock as we drove 40 mph chasing the “extinct” black rhino on the side of the hill. It was surreal to see a creature I was told I would never see. Eventually the black rhino stopped and so did the car. We all watched it stand there until it decided it didn’t like us. I pulled out my binoculars and watched it watch us. It snorted very angrily and proceeded to break a tree in half with its massive feet. The entire car was like a herd of deer in headlights. It sprinted towards us infuriated. Donnie turned the truck on and sped out of there. The rhino made a right turn and disappeared into the wilderness. It was one of the most bone-chilling experiences of my life, but at the same time the most beautiful. I only dreamed about seeing a black rhino, and I was more than happy to be charged by one.